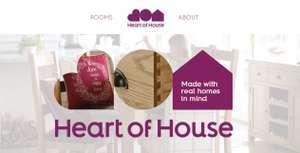 Argos Heart of House furniture range is on offer for Buy One Get One Half Price plus if you enter code FURN20 at the check out you get another 20% off purchases over £150. Thanks OP. I've just spent loads of money to buy furniture for my brand new house. Delivery in November when I pick up the keys. I find their furniture prices slightly cheaper than on other websites so with double discount prices are great. Just worth to mention that if you buy more than 2 items sometimes it's best to place 2 or more orders as discount is applied on the cheapest item. So even with additional cost of delivery it might work out cheaper placing order with 2 most expensive items first.